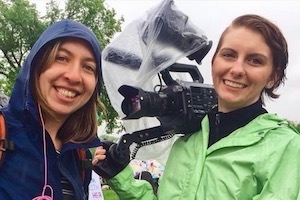 The rain didn't stop American University MFA students Elizabeth Herzfeldt-Kamprath and Ashley Holmes from documenting the march. In the current political climate, with funding cuts to research and science looming and open refutation of verifiable facts in the media on a regular basis, many believe nothing can be taken for granted - not even the preservation of fact-based science. On April 22nd, a March for Science took place to push back against this tide on the Mall in Washington, DC. and in other cities across the country. Under the direction of film professor Larry Kirkman, more than 20 graduate students, alumni and professors documented the March for Science in Washington, DC. SOC video crews were embedded with AAAS, The Nature Conservancy, Defenders of Wildlife, The Planetary Society and National Center for Science Education. "We followed the scientists and their organizations who came out to protest for the first time. When do we have enough scientific knowledge to determine public policy? That question was raised emphatically at the March for Science under the banner Science, Not Silence," Kirkman said. "We found an intensity, an urgency about matters of life and death and a fear of irreversible consequences, that marks a new era in science communication," continued Kirkman, ""The scientists and their organizations are responding to reversals of policies based on scientific evidence and the Trump administration's plans to defund research across federal agencies." MFA student Tony Brunner captures the scene at the March for Science. Photo by Larry Kirkman. SOC Professor and Center for Environmental Filmmaking Director Chris Palmer also helped coordinate volunteers, and the Centre supported the effort with funding, gear and outreach. There were ultimately three film crews sent out to cover the March for Science on April 22. The crews produced a mix of videos and photos of the march. "The Center was honored to work with, and support, professor Kirkman on the March for Science Video Bank," Palmer said. The video has been deposited in a cooperative March for Science Video Bank in the Center for Environmental Filmmaking to help make films on science and public policy. Already in the works are projects that will "portray the challenges of science communication through the stories of scientists and science advocates on the front lines of the public debate," Kirkman said. Chandler Green, a graduate student at SOC, was one of the volunteers that took part in documenting the march, including a blog post. Green, who holds an undergraduate degree in Environmental Science and a science enthusiast herself, said that this experience meant a lot to her because she was able to witness the growing gap between the scientific community and society. "It was thrilling to document such a historic day in which hundreds of thousands of scientists directly addressed that barrier in a celebratory, non-partisan manner," Green said, " it was a worthwhile experience to see so many in the STEM community, who typically stay out of political affairs, step out as advocates for their important research." Green and film partner, Emily Crawford, were able to document the NCSE (National Center for Science Education) throughout the day and also coordinated two interviews with female scientists. The video bank will not only provide a resource for AU members, but also to the organizations and individuals that were documented at the march. "NCSE told us that they would definitely use the footage we shot for their website and other purposes," Green said. Professor Larry Engel worked with the crews and SOC tech staff to set the highest standards for field production. MA Producing for Film and Television student Kennan Cooley helped with outreach and research. MFA student Michael Kuba served as production coordinator.